We’re healthy; we eat right and stay active—but some of us suffer from stubborn pockets of fat that won’t go away despite any kind of diet or exercise. When you work hard to stay fit, it can be very frustrating to have an area that is not responding the way you want it to. If a few stubborn pockets of fat is all that’s preventing you from having the figure you desire, then it’s time for you find the right treatment. 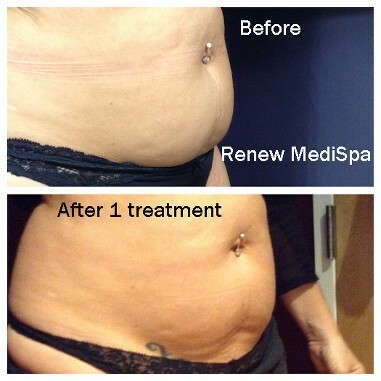 Renew MediSpa was the first site in New Hampshire to offer SculpSure, an advanced nonsurgical fat reduction procedure. SculpSure is a breakthrough in light-based, non surgical body contouring, permanently destroying stubborn fat cells in problem areas such as the abdomen and love handles. SculpSure can help you achieve a slimmer appearance without surgery or downtime. Thanks to its Contact Cooling system and precise heat delivery, SculpSure is also a comfortable, relatively painless treatment—so there’s no anesthetic required. SculpSure uses light-based energy with a 1060 nm wavelength—a specific wavelength that has an affinity for fatty tissue. That means that SculpSure’s energy passes harmlessly through the skin to target the fat deposits underneath. SculpSure also employs Contact Cooling throughout the treatment, protecting the skin and helping to keep the patient comfortable. Once the fat cells absorb heat energy, a percentage of them will be destroyed- up to 24% in a single session! The cellular debris is processed and naturally removed from the body, and thus over the course of 6 to 12 weeks patients should see their slimmer, smoother figure emerge. 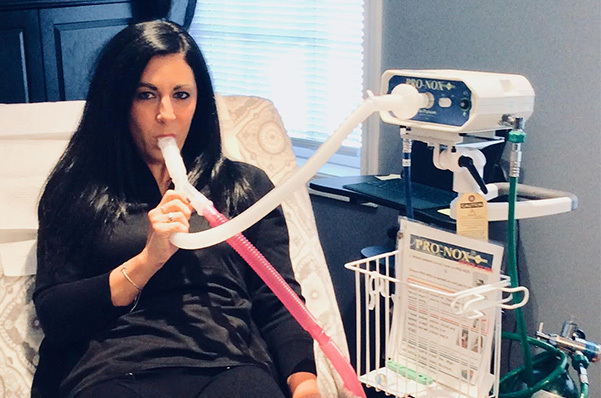 On the day of your SculpSure procedure, you’ll be placed on a comfortable medical exam-style table while the SculpSure applicator is applied to the treatment area. SculpSure only takes 25 minutes to perform per treatment area, and afterwards, patients can go home and resume their daily activities. There is no recovery or downtime and no activity restriction required for the SculpSure procedure. Patients do experience some mild side effects after the treatment, but they’re only temporary and should dissipate after a few days. Minor side effects include swelling, temporary redness, and soreness in the treatment area. For example, when the abdomen is treated you might feel as if you had done a “couple hundred sit ups.” It is a good idea to drink lots of water and to continue regular exercise as this helps the body clear the cellular debris from the treatment area. It can also be helpful to manually massage the area treated, with you hands or with an electric or battery operated massager as this too helps stimulate the lymphatic system. 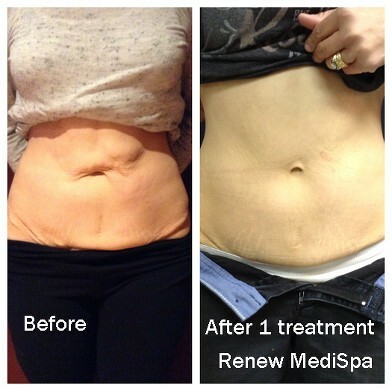 At Renew MediSpa you have options. In addition to our SculpSure Laser, we also have TruSculpt 3D and Profound RF which are used for permanent fat cell destruction as well as skin tightening. CoolSculpting is FDA-Approved to remove up to 22% of fat in the treatment area over a period of a few weeks to a few months following a single treatment. SculpSure is FDA-Cleared to remove up to 24% of fat in the treatment area, over a period of a few weeks to a few months, following a single treatment. SculpSure laser targets only the fat cells, destroying them with heat, and protects the skin from any ambient heating with surface cooling. SculpSure can also adjust the treatment to the individual patient’s comfort level. If a certain area feels too warm, that particular laser panel setting can be adjusted to achieve a more comfortable treatment. 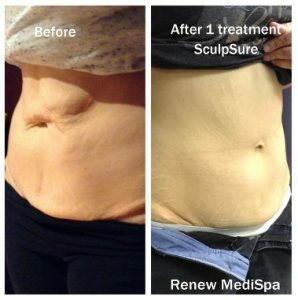 There is no suction required with SculpSure, and treatment sessions take only 25 minutes per area. Also, since Sculpsure spreads its heat delivery, a tapering effect is seen (no sharp “cut off”)- resulting in a smooth transition between treated and untreated regions. We also tend to see some skin tightening in the area treated due to collagen stimulation, which does not happen with CoolSculpting. CoolSculpting works by damaging the fat cells using a suction-based handpiece that delivers freezing technology. CoolSculpting can result in more discomfort in the region treated, and this discomfort can be prolonged after the treatment is completed. Once the handpiece is disconnected, the treated area needs to be vigorously massaged to rewarm the tissue. This is reported to be painful and results in a longer recovery. Prolonged numbness and bruising, as well as contour irregularities (“shelving”), have been reported with CoolSculpting. These irregularities can occur because any tissue not sucked into the applicator is not treated, thus there can be a demarcation between treated and untreated areas which can be felt and in some cases even seen. We are happy to assist you in determining which of our body contouring devices will best meet your needs and goals. In addition to SculpSure, we offer TruSculpt 3D and Profound RF which also have the capability to destroy fat cells. In some cases we will even combine technologies in the same area to achieve the ideal result. Am I a Candidate for SculpSure? You’re an ideal candidate for SculpSure if you’re at a healthy weight and you want to eliminate stubborn pockets of subcutaneous fat on your body. While SculpSure is excellent for removing subcutaneous fat, patients should recognize that it can’t eliminate the visceral fat inside the abdominal cavity. Visceral fat can only be reduced with weight loss. 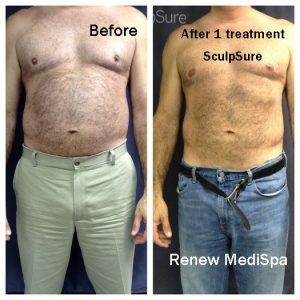 When Will I See SculpSure Results? Many of our patients start to see results as early as a few weeks after their first treatment, with the full results appearance over the course of 12 weeks. How Long Will My SculpSure Results Last? Once SculpSure eliminates fat cells, they do not grow back. Of course, SculpSure won’t remove all the fat cells in the treatment area (that would be incredibly unsafe). If patients gain weight after their treatment, the weight gain will be spread out evenly throughout the body—so the treated area could be affected. It’s highly recommended that patients maintain their results with diet and exercise. If patients maintain their weight and exercise regimen, SculpSure results will be permanent. Is SculpSure a Weight Loss Procedure? SculpSure is an effective fat reduction procedure, but it shouldn’t be considered a weight loss procedure. In fact, it is recommended that patients be close to their ideal weight before they undergo SculpSure. SculpSure is designed to non-surgically eliminate stubborn pockets of fat on the body that won’t respond to diet and exercise. Additional PAC’s/sessions- cost estimated at time of treatment so that we may take into account the size of the region(s) you wish to treat and the number of PACs needed to achieve the desired results. If you’re interested in learning more about SculpSure, call us today to schedule your appointment.